It is hard to make any comment at all after the scenes of destruction that have been filling the airwaves since Friday. But as the immediate disaster starts to move into recovery, then rebuilding, the issue of energy supply in Japan will doubtless rise up the agenda. In a country with limited natural energy sources, security of supply has been the traditional energy source consideration, although more recently this has been augmented with greenhouse gas emission targets. In terms of primary energy demand for electricity production (see chart), data for 2008 from the IEA shows a 3+ way split – the key components being gas, coal and nuclear. Oil products (e.g. 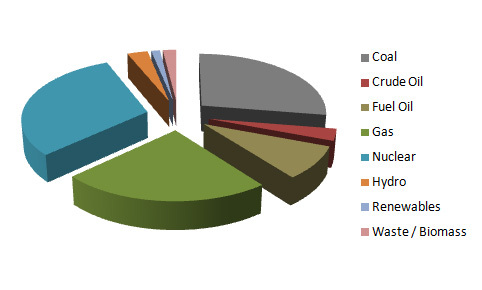 fuel oil) are a further important part, followed by much smaller contributions from renewables, waste, biomass and geothermal. The nuclear generated electricity comes from 55 operating nuclear plants (including those in Fukushima) for a total of about 51 GW of capacity. With rolling blackouts now underway on Tokyo as a result of the cluster of nuclear plants in the Fukushima area now out of action, it is clear that the grid is very dependent on nuclear power. In the short term all the other generating capacity will have to be maximized to make up for the loss of the Fukushima facilities. The load is likely to fall on coal, fuel oil and natural gas which will further stretch international supplies at a time of high energy prices and disruption to coal supply following the floods in Australia. With 10 GW in the Fukushima area now offline (or 20% of the national nuclear capacity), replacement with LNG would require some 8 million tonnes per annum against a global supply of about 230 million tonnes. But in the longer term, what if Japan took the decision to phase out nuclear power? I am not proposing that it should or shouldn’t, but sometimes major events can have a profound impact on societal developments going forward. In terms of potential replacements, current technology points to coal and natural gas, although the latter has an advantage in terms of lower CO2 emissions. Equally, a profound shock such as that experienced in Fukushima could be a catalyst for accelerating the development of solar PV and concentrated solar in Japan. In 2008 Japan imported about 68 million tonnes of LNG, of which about two thirds was used for electricity production. In the same year electricity production from the nuclear power plants was about 10% less than that produced by natural gas, so replacing that with natural gas would require another 40 million tonnes of LNG imports per annum. By comparison, annual LNG production in Qatar, the world’s largest supplier, is some 80 million tonnes. As already noted, global production is now 230 million tonnes, but it is growing rapidly. For example, the Gorgon project in Australia which is now under construction will produce 15 million tonnes of LNG starting in 2014. But the impact of Fukushima could be more profound. Arguably nuclear is undergoing something of a renaissance as nations grapple with the challenges of energy supply, diversity of supply and CO2 emissions. According to the World Nuclear Association there is currently more capacity proposed, planned, on order or under construction (609 GW) than is presently in operation (378 GW). Of this, 64 GW is actually under construction with 176 GW on order or planned. Reverting to coal, for example, even with modern efficient facilities, could result in an additional billion or more tonnes per annum of CO2 emissions by the end of this decade if 200 less nuclear plants were constructed than current expectations. It is early days and emotions remain high, but balancing climate risk against nuclear risk looks certain to feature in the energy discussion for some time to come. A Focus on the USA – on target ?? Excellent analysis David. You mention LNG and gas as well as CSP. If the nuclear option energy / CO2 pathway was reconsidered in Japanu post-Fukushima crisis, might policy-makers opt for a hybrid of natural gas and concentrated solar power (CSP)? FPL have succesfully attached a CSP plant to their combined-cycle gas plant in Florida to reduce emissions and maintain baseload. Hybrid gas-fired CSP units are the norm in the US – all of the old SEGS plants in the Mojave desert (which still operate today at >100% of rated capacity) are co-fired with natural gas; BrightSource’s Ivanpah plant, which is currently being built in California is co-fired with natural gas as well; so the technology is well-proven.